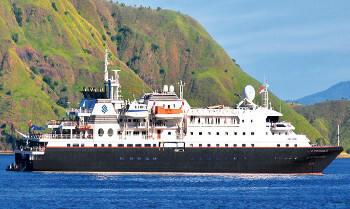 Silversea’s loyal following of adventure travellers can now explore the remote archipelagos of the vast Pacific aboard the sleek, 120-guest Silver Discoverer cruise ship. She’s the perfect platform for viewing these untamed landscapes, with all ocean-view suites and plenty of deck space so that a breaching whale or a pod of dolphins is always within sight. Silver Discoverer’s shallow draft allows her to navigate closer to shore, and with a fleet of 12 Zodiacs, guests can land on isolated shores and explore wetlands and submerged ecosystems, up-close and in-depth. View all Silver Discoverer cruises or view more options for Silversea cruises. The Day Lounge serves as the main Breakfast, Lunch, Afternoon Tea and Snacks area. This comfortable seating area with plenty of natural light, also comprises a 24-hour self-service coffee, tea and juice bar, which makes it an ideal place onboard to relax and reflect on the days activities and future expeditions to come. Onboard services in the Beauty and Massage Room include manicures, pedicures, massages and other spa treatments. Appointments for these Beauty Salon services may be made onboard the ship.